Hi! 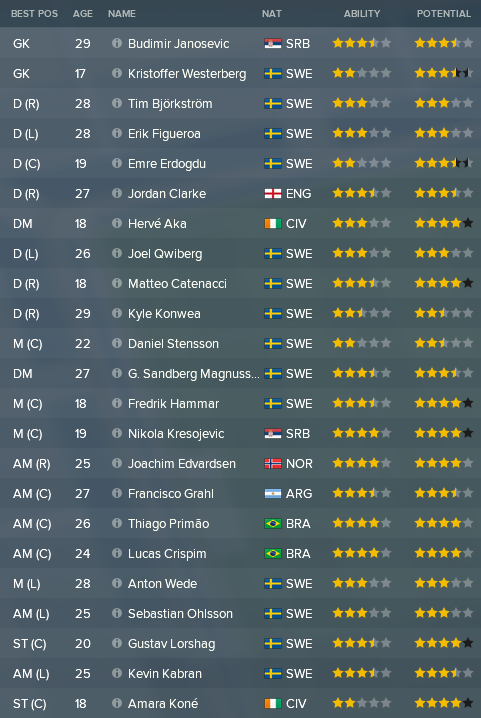 MikaelinhoFM here with the seventh episode of my first ever FM18 blog “The Bromma Boys” about Swedish talent factory Brommapojkarna. I actually wrote a post about why I use the term ‘Talent Factory’ – you can check it out here: BP Talent Factory. 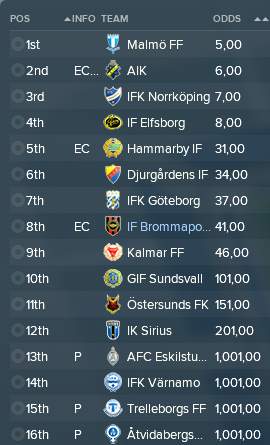 In the two previous episodes you saw us finish in third place in our first season back in Swedish Premier Division Allsvenskan, which means European football in the season to come! Sadly, to save us financially the board saw it fit to sell wonderkid Ludvig Johansson to French giants Monaco. From this episode moving forward I will change the setup of the episodes a bit. Every year will still be covered by two episodes, but instead of splitting the year into first half/second half episodes, the first episode will be a complete season summary and the second episode will cover everything Academy related. I hope that this will offer a better reading experience! Therefore, in this episode we will look at what happened before the 2019 season started, such as transfers in and out, and then show how we performed in the various competitions. Without any real money to spend, this was basically yet another uneventful transfer window. We brought in three promising youngsters in Ivorians Aka and Koné and Australian Pettit. We also brought in Argentinian AMC Grahl for free and backup central defender Nyamsi on a loan from French side Rennes. We accepted immediately a €29K offer for failed signing Mahmutovic, basically getting our money back. We also decided to loan Aka out to Superettan club GAIS because of massive competition for playing time in central midfield. Still in the red, but over a million closer to breaking even than a year ago. Perhaps this is the year when we start making some real profit!? We managed to up our ratio of Swedish versus foreign players, which was one of my goals going into this season. A well-rounded squad with experience mixed with a couple of decent prospects. In the striker spot we look a bit thin behind first choice Lorshag with young Ivorian Koné being the only real back-up, but let’s just hope that Lorshag keeps himself fit and healthy! On the other hand the competition is fierce for the AMC position with Brazilians Thiago Primão and Lucas Crispim feeling the heat from newcomer Grahl! Many of our younger players are improving nicely, and I’ll hopefully be able to give them enough playing time to let them keep improving! We got off to a shaky start, losing to Östersund, but managed to beat lower league teams Varberg and Mjällby, securing the group win by the smallest possible margin. Ending up on equal points as Östersund who lost a game as well and the same goal difference. Our 6-4 victory in the final game got us through on more goals scored than Östersund. Nice to go through, but our shaky form was a bit troublesome. We got a tough quarter-final draw against Elfsborg, but managed to scrape through with a 2-1 win. We got an even tougher draw in the next round, antagonists Hammarby away. A tough but swingy game ended 2-2, but we showed real strength in the extra time scoring twice to secure a 4-2 win! Our opposition in the final were none other than giants Malmö, a terrifying opposition. I feared that we were in for the loss, considering our lack of experience compared to our opposition. We did manage an early goal from Kevin Kabran and fought like animals for the rest of the game. 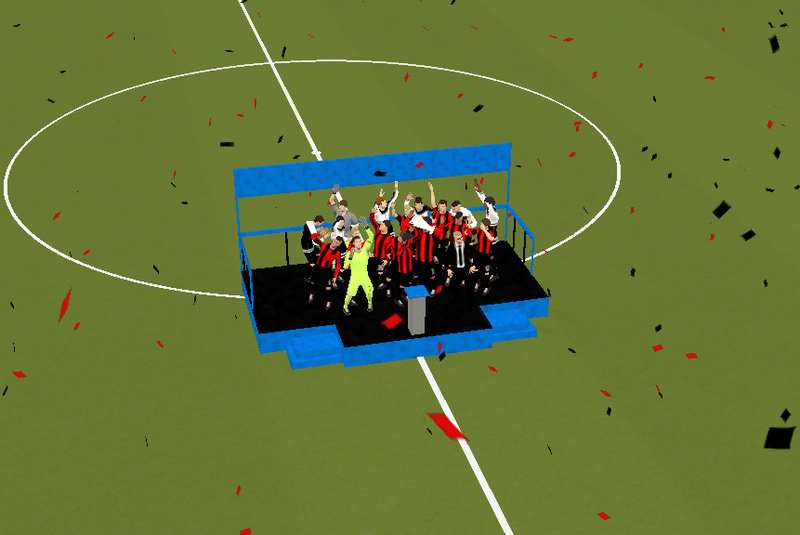 We kept a clean sheet and when the referee blew the final whistle we were crowned Cup Champions! An absolute delight to win our first title, hopefully the first of many to come! Even though we managed a third-place finish in 2018 and just won the Swedish Cup, the media were not impressed. They predicted us being stuck in the middle of the table without interfering with neither the title challenge or relegation battle. I hold higher hopes, with dreams of winning it all, but hoping at least for European qualification. 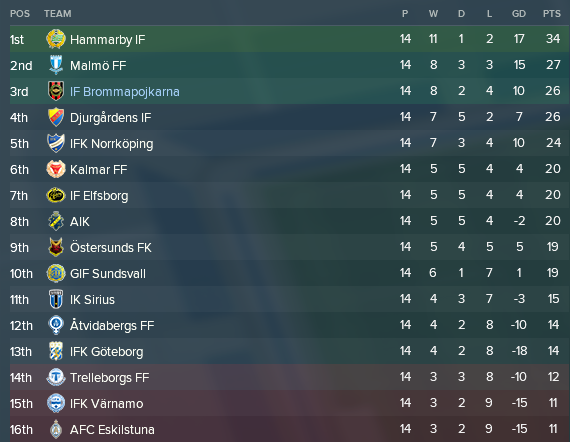 Hammarby, managing a fantastic spring season, were well ahead of four teams, including us as we consistently trailed seven or eight points behind. A tough challenge to make up that sort of point deficit and very tight in the fight for European competition spots. We came back from summer really strong, going unbeaten in our first eight games, closing the gap to Hammarby to 2 points and tied in second place with Malmö. 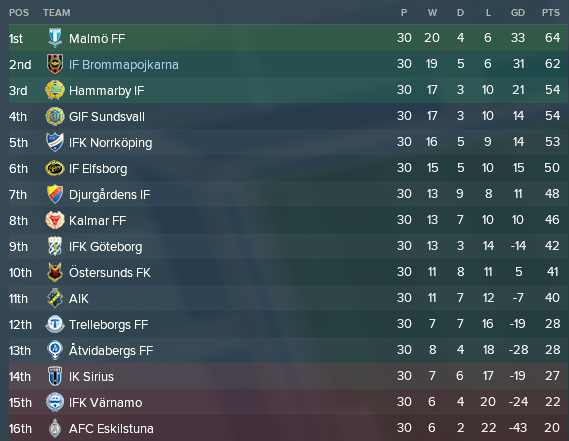 After losing to Kalmar we managed another six straight unbeaten games, leaving us in second place before the final game, 2 points behind Malmö. Since Malmö surprisingly lost their final game we had the chance of becoming champions. Sadly, we didn’t manage to score against IFK Göteborg, losing 0-1. I think this was mainly due to our inexperience with these important games. An expensive lesson, but still another lesson learned. We end up in second place, which means an important chance to qualify for the Europa League group stage in 2020. For the second time in BP history we played games in a European competition. We managed to get through both the second and third qualifying rounds by small margins. We held a small hope of surviving the fourth round and going through to the group stage. 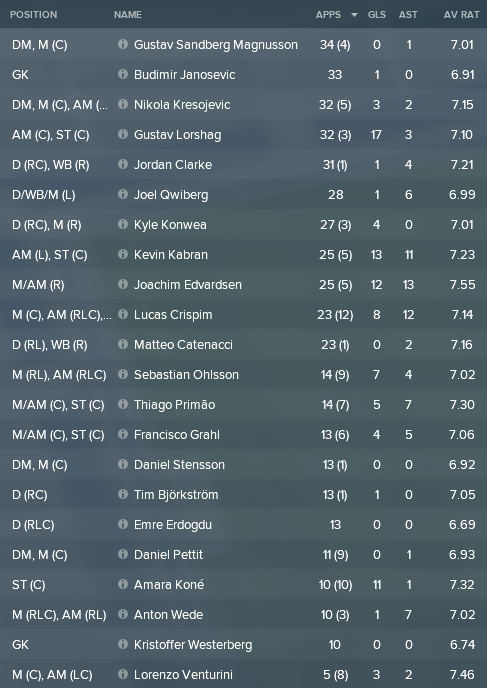 Stand out performers during the season were Lorshag, scoring 17 in 32 from his position up front along with attacking midfielders Kabran (13 goals and 11 assists), Lucas Crispim (8+12) and surprise man Edvardsen (12+13). The latter was also voted Fans’ player of the season by a mile! In the list above you see two new names, Daniel Pettit and Lorenzo Venturini, two young guns who joined us during the season. Truly exciting prospects, but you’ll have to wait until next episode for their introductions! In the next episode we will take an in-depth look at what’s been cooking in the Academy, aka the Talent Factory, during 2019. Which player has the highest BP Style Rating and therefore best personifies our style of play? Do we have any surprise players developing into true wonderkids? Read the next episode to find out! This entry was posted in FM18 Stories, Football Manager 2018, The Bromma Boys | @MikaelinhoFM and tagged brommapojkarna, europa league, europe, fm stories, fm18, football manager, sweden, swedish allsvenskan, swedish cup. Bookmark the permalink.